Guatemalan artisan Eladio Chiroy uses a traditional foot pedal loom to weave local cotton into vibrant table linens. 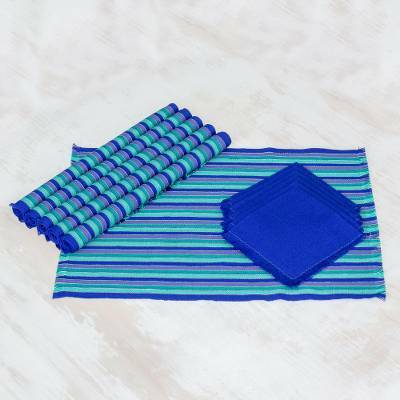 Aqua, emerald, cobalt blue and deep lilac blend to create mesmerizing stripes evoking the colors of the sea.Featuring six napkins in a solid cobalt blue and six striped placemats, these table linens make a wonderful addition to any home. You can find cotton placemats and napkins 'Colors of the Sea' (set of 6) by Eladio Chiroy in tableware categories such as Hand Woven Table Linens, Nat Geo Decor Table Linens, Cotton Table Linens, Napkins and Rings Table Linens and Placemats Table Linens. Enjoy exploring these sections for other Novica treasures. "Beautiful table linens and more." This set of placemats and napkins is beautiful and exactly what I needed for my new kitchen table. The package came gift-wrapped with a geometric design printed onto recycled paper. A worry doll was attached to the ribbon along with an explanation of the doll's use and history in Mayan culture. The napkins are on the small side but perfectly matched with the placemats. If needed, it would be easy to find additional napkins that coordinate well. I am very happy with this purchase, the wrapping paper and worry doll enhanced my pleasure. It felt like I had bought myself a present and somebody gave me an additional gift. Thank you Senor Eladio Chiroy! These just arrived and I can't wait to use them with my Radiant Flowers dishes.